Guest post! Today, seasoned commenter Salada takes us through a classic apple pie. Due to the unusual weather, the apple harvest is excellent this year, so shop prices are reasonable and if you’re really lucky, a friend, relative or Freecycler will give you some windfalls for free. approximately to Barbara Hammond’s Dutch Apple Pie (a double crust plate pie) recipe from Cooking Explained (1963 edition). 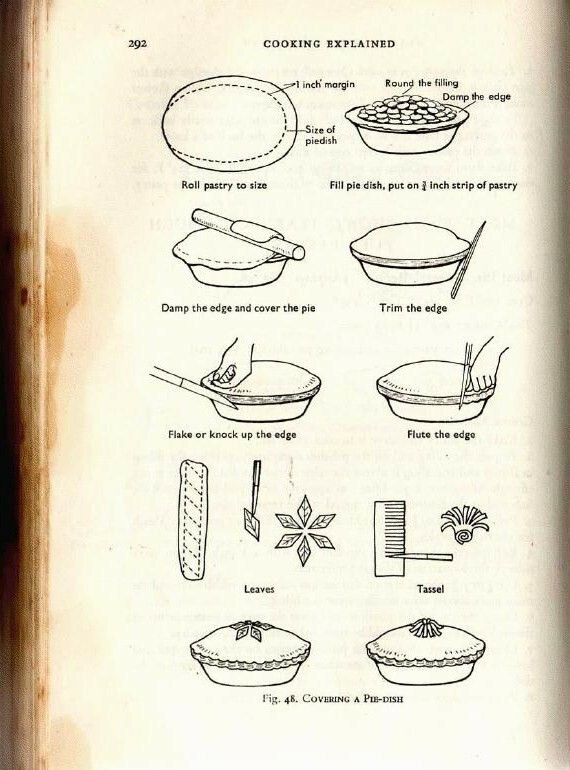 While I get my act together to write up the blueberry pie (my final pie, mini pecan tarts, won’t be posted as I went way off-recipe), why not enjoy the wise, graphic counsel of Barbara Hammond, from Cooking Explained (1963)? Posted by Elly, with thanks to Salada for sending it to us.